I just bought this awesome, colourful baby box to make my (or my husband’s) life easier when we go outing with Baby B.. 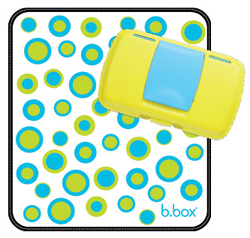 It is a (bright and colourful) container that holds a changing mat, diapers and baby wipes inside it!! I was looking for something like this to avoid another episode of “diving” into my handbags looking for stuffs when I want to change B’s diaper. Everything I need is already inside the box. In fact, I can always slip in a sample size diaper rash cream too!! Its mainly for short outing like when we go to the malls or visiting relatives.. Well, I do have a baby bag to carry all B’s stuff if needed but sometimes mommy needs to look chic too!! 😉 This baby box is cool and practical, hence the name, Essential Baby Box by b.box!! This is how the inside looks like.. the changing mat is folded and held with a holder. 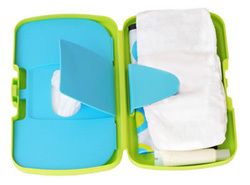 You can also slip in 2 or 3 diapers in it and also on the other side of the cover, there is an opener for your baby wipes.. This box has 2 wipes opener sides.. from the inside or the outside. 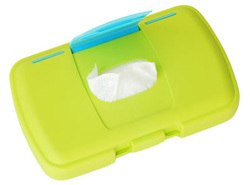 Not that I have found any wipes brand that have double-sided opener but at least with this box you can either choose to access from inside or outside.. Yes, I am an organizer-freak person! Not 100% freak.. but maybe 83% 😉 I love everything that’s organized and well-arranged. Owh.. another good news, this Essential Baby Box is BPA, PVC and Phthalate free and made of durable and washable materials like polypropylene. In a simple words, it is free of the harmful chemical to our baby and easily clean.. It comes in 5 different colours.. all are eye-catching! But when I saw this one in lime green.. I’m sold!! Posted on October 19, 2011 December 9, 2012 by Dr Halina Mohd YunosPosted in Mommy LikesTagged baby stuff, organize, storage. Halina.. chantek la.. and very practical.. where did you get it? Hi Dr. Halina. 🙂 browsing thru my hubby’s cousin’s FB i came across your page and your blog and now i am in LOVE with this box. i went to page but couldnt find it. can u link it elsewhere if u x mind? thanx a bunch! kak salina:i nk tlg jwb.the link attach tu ade 3 dots at the end.sbb tu klo klik kat situ,it wont appears..
i’m also in love with this box.i would love to buy it in pink but since i’m carrying an active lil boy,pink will look a bit awkward for him soon.i think..hehehe..
Apple cider vinegar has an acid in it that neutralizes the acids in your stomach. as a treatment for the disorder celiac disease. Changing your diet can have a tremendous effect on the symptoms of acid reflux.